A Visit to the Capital of Srilanka – Colombo and the World Heritage site Sigiriya with a taste of Wildlife and in the end relaxation at the beaches of Male. 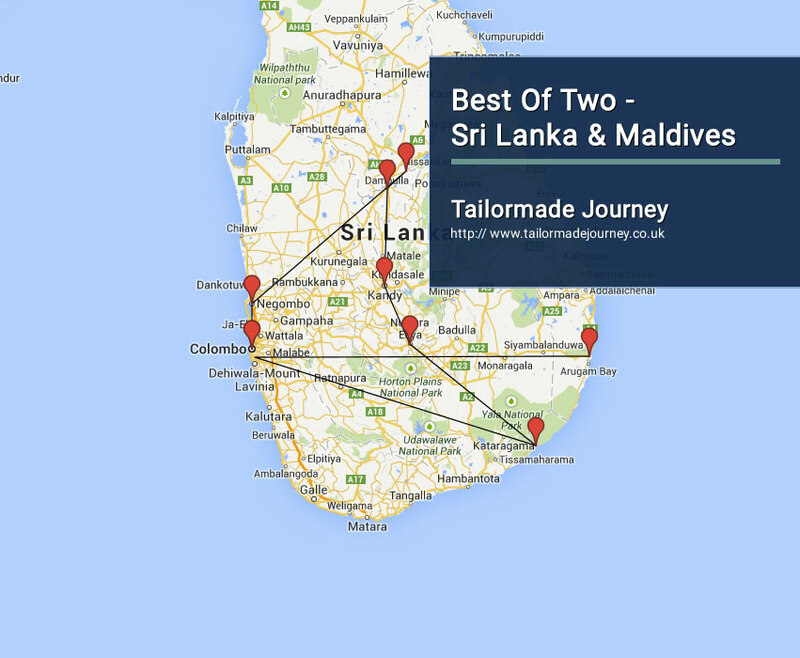 Arrive Leave Colombo 1 Night > Drive Habarana 3 Nights ( Excursion Anuradhapura ) > Drive Dambulla > Drive Kandy 3 Nights ( Pinnawala ) > Drive Nuwara Eliya 1 Night > Drive Yala 1 Night ( Wildlife ) > Drive Colombo 1 Night > Flight Male 7 Nights ( Beach ) & Leave. Dinner and Overnight Stay at the Hotel in Colombo. Late afternoon, visit the Rock Fortress of Sigiriya. SIGIRIYA – A remarkable archeological site made unforgettable by its dramatic setting – the ‘Lion Rock’ is a citadel of unusual beauty rising 200m from the scrub jungle situated in the Central District. This ancient rock fortress and palace ruins famed for its frescoes, was built during the reign of King Kassyapa (AD477 -495). It was developed into a complex city and fortress. Considered one of the most elaborate and imaginative planning sites of the first millennium, the plan combined concepts of symmetry and asymmetry to intentionally interlock the man-made geometrical and natural forms of the surroundings. It contains a park for the royals, laid out on a symmetrical plan and contains water retaining structures, including sophisticated surface / subsurface hydraulic systems, some of which work even today. There is also a man made reservoir. The Gardens of the Sigiriya city is among one of the oldest landscaped gardens in the world. They are divided into three distinct but linked forms; water gardens, cave and boulder gardens and the terraced gardens. ANURADHAPURA – The Sacred City of Anuradhapura, 3rd BC ‘ 10th AD ‘ A world Heritage Site Anuradhapura, Sri Lanka’s sacred ancient city, surrounded by 3 great man-made lakes, is located in Sri Lanka’s Northwest ‘dry zone which is arid, rolling, open country. At the height of its glory, Anuradhapura ranked beside Nineveh and Babylon in its colossal proportions. The monumental dagobas, Jetavana Dagoba, Abayagiry Stupa and the Ruwwanveli Seya are amongst the greatest architectural feats of its age, and have been surpassed only in scale by the great pyramids of Khufru & Khafra at Gizah. Buddhism, was to become a cornerstone of the Aryan Sinhalese civilization. The sacred Sri Maha Bodhi Tree (Peepal) is a sapling of the sacred Bo tree in India, in the shelter of which Prince Siddhartha Gauthama attained supreme enlightenment & became Buddha. It was gifted to Sri Lanka by Emperor Asoka in the 3rd century BC and is the oldest recorded tree in the world (2,250 years). The city has many museums that bear testimony to Sri Lanka’s ancient and dynamic civilization, which include the Anuradhapura Archaeological Museum, the Abhayagiri Museum and the Jetavanarama Museum and many other places of interest. Thereafter, visit Mihintale. Mihintale is a mountain peak near Anuradhapura in Sri Lanka. It is believed by Sri Lankans to be the site of a meeting between the Buddhist monk Mahinda and King Devanampiyatissa which inaugurated the presence of Buddhism in Sri Lanka. It is now a pilgrimage site, and the site of several religious monuments and abandoned structures. POLONNARUWA – lonnaruwa, the 2nd most ancient kingdom of Sri Lanka is an interesting mix of Buddhist and Hindu structures that are a testament to the different kings who reigned over this ancient kingdom. Polonnaruwa rose to prominence between the 11th and 13th centuries and thrived during the reign of the famous monarch, King Parakramabahu I, who did much to create a resplendent city. His greatest achievement was the construction of the sea of Parakrama, a huge water reservoir spanning an area of 6280 acres. The ruins at Polonnaruwa are within walking distance and many of them set in tree-shaded areas, a welcome refuge from the tropical sun. This ancient city is one of the best planned archeological relic sites in the country, standing testimony to the discipline and greatness of the Kingdom’s first rulers. Duran, Duran used Polonnaruwa as a back drop to their music video ‘Save a Prayer’ in 1982. Thereafter, proceed to Minneriya National Park to do a safari by jeep. MINNERIYA – Its centerpiece is the large Minneriya Tank, and the park also boasts an unusually wide range of habitat types, from dry tropical forest to wetlands, grasslands and terrain previously used for slash-and-burn agriculture. For most visitors, the principal attraction here is elephants. Minneriya forms part of the elephant corridor which joins up with Kaudulla and Wasgomuwa national parks, and up to 200 of the beasts can be found here at certain times of year during their migrations between the various parks. Other mammals found in the park include sambur, spotted deer, sloth bears and leopards, and there’s also a good chance of seeing macaque and purple-faced languor monkeys. In addition, an enormous number of birds have been spotted at Minneriya, including endemics such as the Sri Lankan hanging parrot and the crimson-fronted barbet. On completion return to Habarana for overnight. DAMBULLA – See Dambulla and be dazzled! Home to the largest and best preserved cave temple complex in Sri Lanka, the Iron Wood Forest (Namal Uyana) and the Rangiri Dambulla International Cricket Stadium, built in just 167 days. Dambulla is also said to have the largest rose quartz mountain range in South Asia. The Rock Caves are situated on a vast isolated rock mass 500 ft high with a span of a mile around its base. Access these caves by climbing approximately 200 steps and 18 terraces. The Golden Dambulla Rock Temple, which is on the highest terrace, consists of 5 magnificent caves built into the rock. They house a collection of 150 statues of the Buddhist order and the island’s history. The first cave houses a 14m long Buddha statue depicting the final extinction carved out of solid rock. The 2nd cave, which is the finest and largest, has 40 seated statues of the Buddha. Also on display are statues of Hindu Gods. The entire cave, walls and ceilings are covered with Buddhist murals which are of the finest in Sri Lanka. The 3rd cave with its paintings on the ceiling & walls in the Kandyan tradition contains 50 Buddha statues. Visitors are treated to a panoramic view of the surrounding flatlands, reservoirs and forests. KANDY – This jewel of a city, set 480m above sea level and surrounded by mountains is the hill capital of Sri Lanka. Kandy was the last independent Kingdom of Sri Lanka, which survived two centuries of colonial incursion before finally falling to the British at the beginning of the nineteenth century. The Pinnewala Elephant Orphanage is one of Sri Lanka’s most popular attractions. Situated halfway between Colombo and Kandy, the orphanage has a population of about 75 elephants, making it the world’s largest collection of captive elephants. The elephants here range from newborn calves to elderly matriarchs and include orphaned and abandoned elephants, as well as those injured in the wild. Amongst them are its famous residents, Sama, the lame elephant injured by a land mine during the ethnic conflict in the North and Raja, the blind elephant. Experience the sheer delight of watching these great pachyderms frolic in the river at bath time or the baby elephants being fed twice a day. On completion return to the Hotel. In the evening, visit the Temple of the Tooth Relic. Thereafter witness a cultural show. This is the famous kandy cultural program. It starts in the evening and runs for more than 1 hr. The skills of the traditional mucisians of kandy, thier drums and dance is all very much entertaining. There are seven kind of dances. The fire show takes the europeans by surprise as they woudn’t have seen anything like that in thier life time as the artists eat and rub fire on thier body. Its really nice experience. Morning do a city tour of Kandy. This jewel of a city, set 480m above sea level and surrounded by mountains is the hill capital of Sri Lanka. Kandy was the last independent Kingdom of Sri Lanka, which survived two centuries of colonial incursion before finally falling to the British at the beginning of the nineteenth century. Thereafter, proceed to Peradeniya. Visit Royal Botanical garden. Set 6km southwest of Kandy in a loop in the Mahaweli Ganga lie the expansive Peradeniya Botanical Gardens, the largest and finest gardens in Sri Lanka, covering almost 150 acres and stuffed with a bewildering variety of local and foreign tree and plant species On completion return to the Hotel. Proceed to Nuwara Eliya. En route, visit a tea plantation and a tea factory, where the best tea in the world is produced. Here you could observe all about the process of manufacturing tea. You can also see how tea is graded. Taste a cup of pure Ceylon tea in the factory. NUWARA ELIYA – Nestled 6,200 ft above sea level, amid lush tea plantations, Nuwara Eliya is a charming hill station developed by the British planters in the late 1800s. Pleasant climate, great natural beauty and champagne tea delight and charm all its visitors. Nuwara Eliya is home to many renowned institutions of Sri Lanka’s colonial British era, such as the Racecourse, the Hill Club, Grand Hotel and its famous 18 hole Golf Course. Morning Drive to Yala. Upon arrival in Yala check in at your pre booked hotel. Late afternoon, do a safari by jeep at the Yala national park. YALA…….Yala National park is Sri Lanka’s most visited wildlife reserve. Covering an area of 1260 sq. km, the parks’ dry-zone landscape is strikingly beautiful. The Reserve contains Jungles, beaches, freshwater lakes, rivers and scrubland, punctuated with enormous rocky outcrops. Yala has the world’s highest concentration of Leopard and sightings are frequent. In addition there are approximately 32 species of mammals (Elephants, Sloth bears, Sambar deer, spotted deer, muse deer, barking deer, wild boar, wild buffaloes, pangolins, porcupines, stripe-necked & ruddy mongooses, rabbits, (rare) wild cats and jackals. There is also the macaque, langur and toque monkeys and many more…), 125 species of birds, many reptiles and lagoon fauna species have been recorded in the park. Dinner and Overnight Stay at the Hotel in Colombo . Overnight Stay at the Hotel in Male. Today you are transferred to Male Airport to board flight for Onward Journey. Kuredu Island Resort & Spa is a beach front property situated in Kuredu in the Lhaviyani Atoll Region. The resort has an outdoor pool, a spa centre and a fitness centre which is complimentary for the guests. A 24-hour front desk and tour desk service is provided. Guests can also enjoy a drink at the bar and on-site restaurant. All rooms include a flat-screen TV and a mini bar. Certain units have a seating area to relax in after a busy day. Views of the sea, pool or garden are featured in certain rooms. Every room comes with a private bathroom. Superior rooms include a spa bath or a hot tub. Reethi Beach Resort is located on the beautiful and lush Fonimagoodhoo Island, surrounded by a beautiful lagoon and white, sandy beach. It offers a fitness centre, a massage parlour and a spa and wellness centre. It features 5 restaurants and 5 bars. All air-conditioned rooms are equipped with a minibar, satellite TV and coffee making facilities. The private bathroom comes with hot/cold water, free toiletries and hairdryer. At Reethi Resort you can find water sport facilities, windsurfing, diving and snorkelling. The property has a sports complex and offers a variety of private and group excursions. Dining options include Moodhu Bar& Restaurant, a 24-hour restaurant and coffee shop built on stilts over the lagoon. Reethi Grill is an open air restaurant that serves grilled food while Alifaan is a poolside restaurant that serves a selection of snacks. Saima Garden is a boutique restaurant serving Maldivian and International cuisine. Ramada Colombo is located in Sri Lanka, a 5-minute walk from Colombo Fort Railway Station. The hotel offers an outdoor pool, 2 restaurants and a bar. Free parking is available. The air-conditioned rooms are equipped with a minibar, cable TV and coffee/tea maker. Private bathrooms and a personal safe are provided. The hotel features a business centre, room service and laundry services. Guests can book excursions at the tour desk. The hotel’s bar has a pool table. This property is 3 minutes walk from the beach. OZO Colombo is centrally located just 1.3 km away from Bambalapitiya Railway Station. Welcoming guests with an outdoor swimming pool and a buffet-style restaurant, this luxurious property is also equipped with free Wi-Fi access at all areas. Housed in a modern building, the accommodation is only 1.6 km away from Barefoot Gallery and 1.9 km from the British Council. Bandaranaike International Airport is 33 km away and airport shuttle services can be arranged. Offering ample natural sunlight and sweeping sea views in some rooms, stylish guestrooms come fitted with a minibar, air conditioning and carpeted flooring. The contemporary en suite bathrooms feature bath amenities and a hairdryer. Refreshing workouts can be enjoyed at the fitness centre. Guests staying at OZO Colombo can also utilize the meeting facilities. A 24-hour front desk can assist with car rentals and free parking facilities.